Guided Bison & Buffalo Hunts in Utah, Wyoming & Colorado. 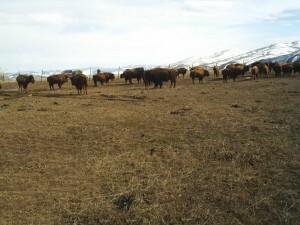 Idaho Bison And Buffalo Hunts! If this is your first time experiencing a reserve hunt in Utah, you might not know what to expect from your hunting guide. To start off with, please check our prices so that you know what to expect. As a quality Utah hunting outfitter, we want to make your guided hunting tour a great experience for you, so feel free to contact us if you have any additional questions not answered here. To schedule your hunting guide, please visit our hunting reservations page, download our reservation form, and mail it to us. If you have any questions or wish to make changes to your reservation please get in touch with us using the information on our Contact Us page. In Utah we offer great area to hunt bison, which boasts a public bison herd that is located on Antelope Island in the Great Salt Lake. The problem is that getting a tag can be extremely difficult, and you have about as good odds of getting one as you do in winning the lottery. At Hi Mountain, we're ready to step in and give you a great opportunity to guarantee your buffalo by reserving your own hunt. We offer year-round hunting, and we're waiting to hear from you, so get in contact with us and we'll do everything we can to make your buffalo hunt a success. Depending on the time of year you schedule your buffalo hunt the weather may not be too cooperative. Please make sure you are properly equipped and have enough clothing to keep yourself warm during the fall and winter months, as Utah can be quite cold and we do not sell clothing. Additionally, we do not sell guns or ammunition, so you will need to make sure you have enough for your hunt. Make sure that your rifle will be heavy enough to kill a buffalo, and that you have your preferred ammo brand. We do allow bow hunting as well, and we are more than happy to accommodate our visitors that wish to use their bows.